100 Office Road. Warren & Mahoney. For Sale. We don’t normally do real estate listings, but why not? 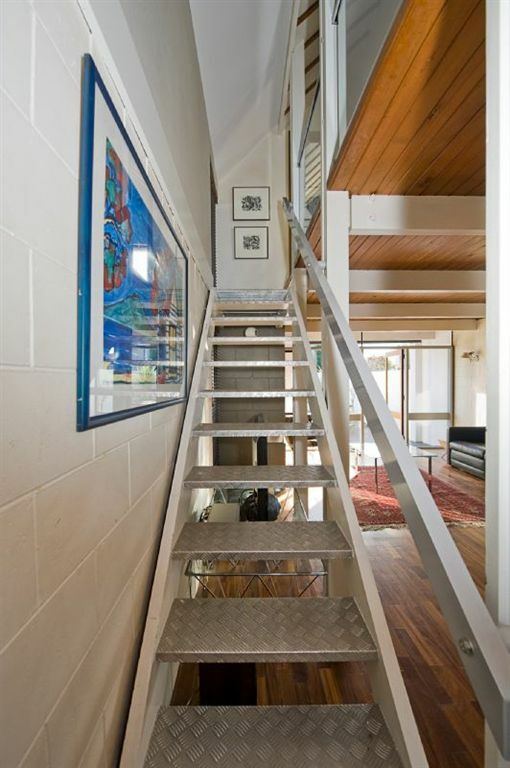 This townhouse is particularly good; designed around ’66 and renovated nicely in the noughties by Warren & Mahoney’s Richard McGowan (please contact Richard directly with any questions regarding the chequer plate stair treads). The building feels like the perfect prototype (and archetype) of the modern Christchurch inner-city home: beautiful and efficient in materials and design. At the open home make sure to say loudly, “mmm, very Miles”. This entry was posted on Tuesday, July 19th, 2011 at 8:03 pm and is filed under 60s, Merivale. You can follow any responses to this entry through the RSS 2.0 feed. You can leave a response, or trackback from your own site. Yes I can confirm that the stair treads in question (and the white painted posts/beams, blue interior walls, webforge landing, glass balustrades) were all undertaken by the current owner after I sold the house. Strategy for these ‘updates’ not entirely clear to me. Gulp. I did try to e-mail you about a year ago, at your work address I think. So it would be good to hear back from you sometime. Thinking of building in Christchurch in a few years time, and would like to get your idea of costs. Wonder if you still have the Fulvia? I sold mine here in Japan years ago, but still drive something a bit interesting. Would like to send you a few shots of our RC house at the edge of a big forest overlooking a valley. But I have found some land on Fendalton Road which looks interesting, as a sort of backstop for the future. A bit funny to be thinking of moving to Christchurch after the big quake, I know. However we have an earthquake here about every 10 days–just a small one usually. May try phoning you at work again on Monday or so.